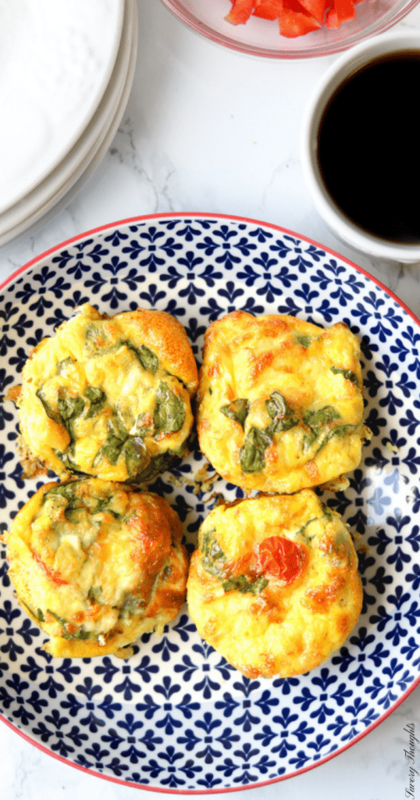 These Breakfast Egg Muffins are exactly what you need for a quick grab and go breakfast. They are loaded with all your favorite fixings. They are healthy, low carb and gluten-free! I constantly have mornings where I am rushing against time. Seriously, I can wake up a couple hours before my scheduled time to prepare myself, somehow, I still run short of time. One thing that never fails me is these breakfast egg muffins. These muffins are my favorite to make for a quick breakfast. They are perfect for mornings when I have no clue what to make for breakfast. They are great for busy mornings. They are easy for the kiddos to grab and go while they are rushed out of the house for sports activities. They can also be served for any occasion. To be honest, they are always a hit! 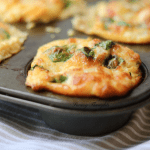 Why this breakfast egg muffins recipe work? My children can be the pickiest eaters in the world! However, if I add bacon to these breakfast egg muffins, they would devour them in no time. No matter how much they tell me they dislike eggs, these muffins are always the first to go. This recipe is quick. Delicious. Requires a few ingredients. And will be enjoyed by everyone in the family. No kidding! They also go well with pancakes, waffles, and cinnamon toast sticks. During brunch or lunch, these muffins are a sure way to make sure you are getting your protein intake for the day. Did I mention they work well with salads? I also like to serve them with potatoes and or vegetables. The possibilities are endless when it comes to these muffins. The beauty of these muffins is that you can add as many ingredients as you please. Are breakfast egg muffins gluten-free? Yes! If you recall from my cloud bread recipe post, I mentioned due to health reasons we are slowly transitioning to gluten-free products. Well, these muffins definitely fall into the gluten-free category. They contain no soy products and no grains! They pretty much satisfy any diet. What’s needed to make the breakfast egg muffins recipe? Not much! You can make these with just eggs, cheese, and salt/pepper to taste. You may add milk if you choose. However, to enhance the flavors you’ll actually need 8 large eggs. ¼ cup chopped onions. 8 grape tomatoes, quartered. ¼ cup chopped spinach. ¼ cup mozzarella cheese, shredded. Salt and pepper to taste. 1 clove garlic, minced. Olive oil cooking spray. That’s it! As simple as that. These ingredients will wow your family at the breakfast table once they are all incorporated and served. How do you make egg muffins for breakfast? Here’s how to make them. 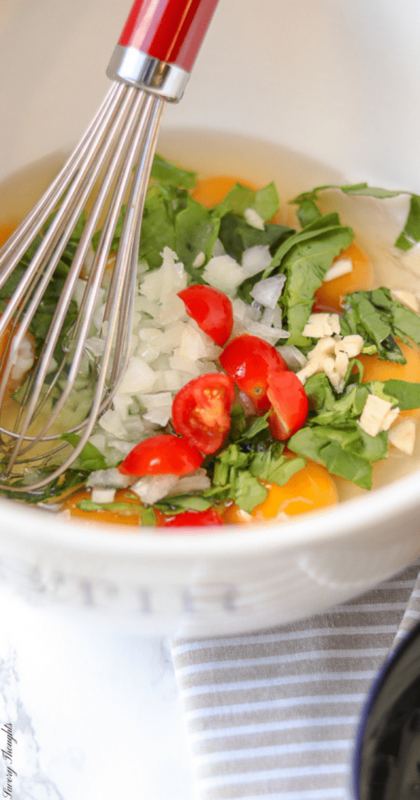 First, you’ll need a large bowl to mix all the ingredients. I find it best to use a Pyrex measuring cup as it is easier when pouring the mixture into the muffin pan opening. You will need a well-greased muffin pan. Pour the mixture into each cavity. Then bake for 25 minutes. Let cool before transferring into a plate. Serve warm and enjoy! 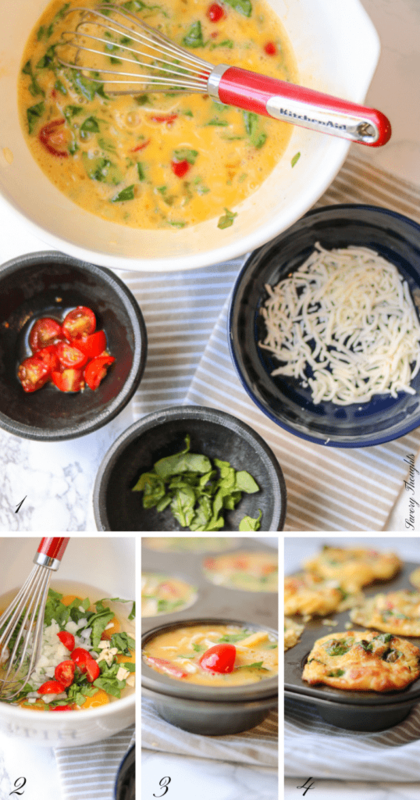 How do you reheat egg muffins? If you end up making too much of these muffins, it’s perfectly fine. They are easy to heat up. simply place the muffin on a plate, heat in the microwave for 1 minute or until the desired temperature is reached, and enjoy. How long do Egg Muffins last? These breakfast egg muffins can last up to one week in the refrigerator. I would not exceed this time. Make sure they are in an airtight container. 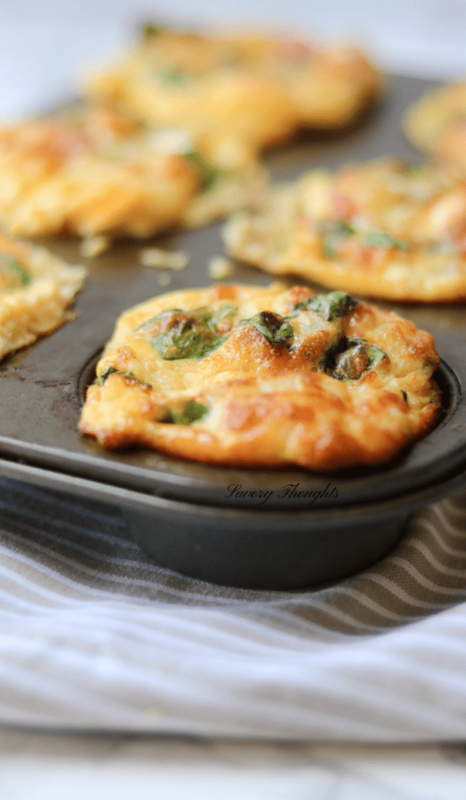 How do you make egg muffins with spinach? One of my favorite ways to make these breakfast egg muffins is to add chopped spinach while I mix the ingredients together. ¼ cup chopped spinach should be sufficient for a serving of 6. 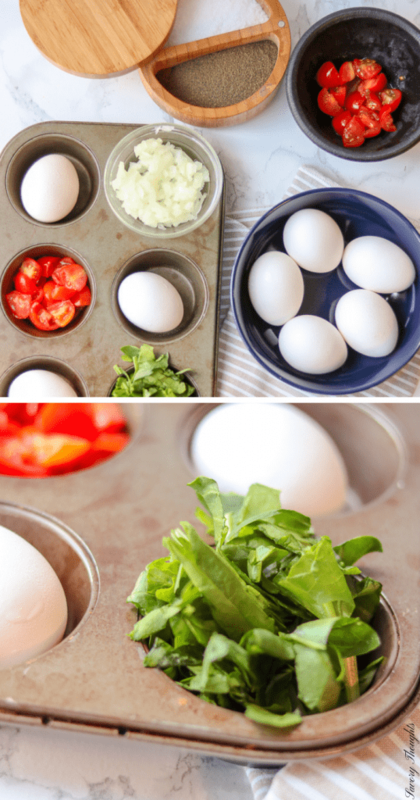 What to eat with breakfast egg muffins? Honey mustard chicken is great when paired with these muffins. Potatoes, green beans, and salads also work well with these muffins. Do Egg Muffins freeze well? Yes, you can freeze egg muffins. Make sure they are wrapped then place them in an airtight freezer bag. I would not exceed 3 months of freezing. Savory Thoughts: Good, better, best. Never let it rest. ‘Til your good is better and your better is best. Did you make these breakfast egg muffins? Tag your Instagram photos with #savorythoughts and mention @savorythoughts so I can see and share your delicious meal! 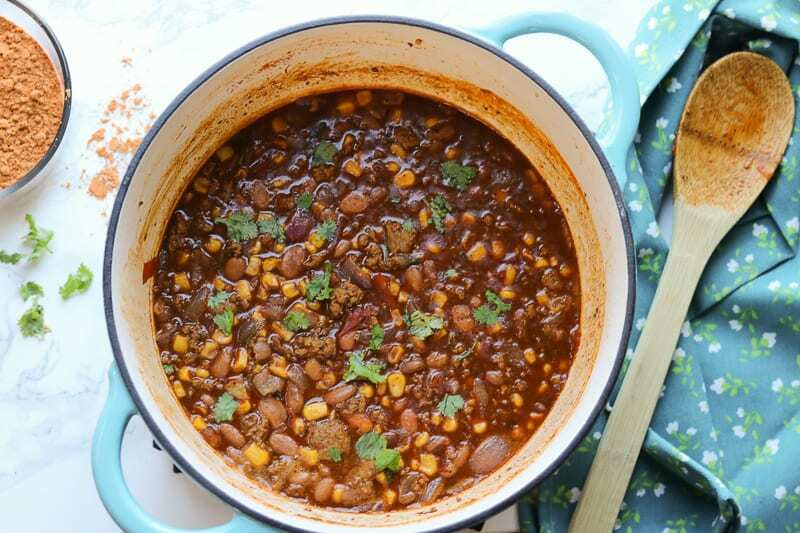 I’d also love and appreciate it if you could rate the recipe below! In a medium bowl combine all the ingredients. Spray the muffin pan with olive oil cooking spray. Pour the egg mixture into each muffin pan opening. Bake for 25 minutes. Serve warm. Love your add ins! I make similar egg muffins for my widowed mother. She finds it so much easier to eat one of these for breakfast or a light lunch than to try and make something. Than you very much, Noel. I’m sure she enjoyed it. Thank you for reading. these look like an easy and tasty breakfast option! It is very good and extremely easy to make. Thank you! I almost always stick to bacon, egg and cheese whenever I make anything with eggs. 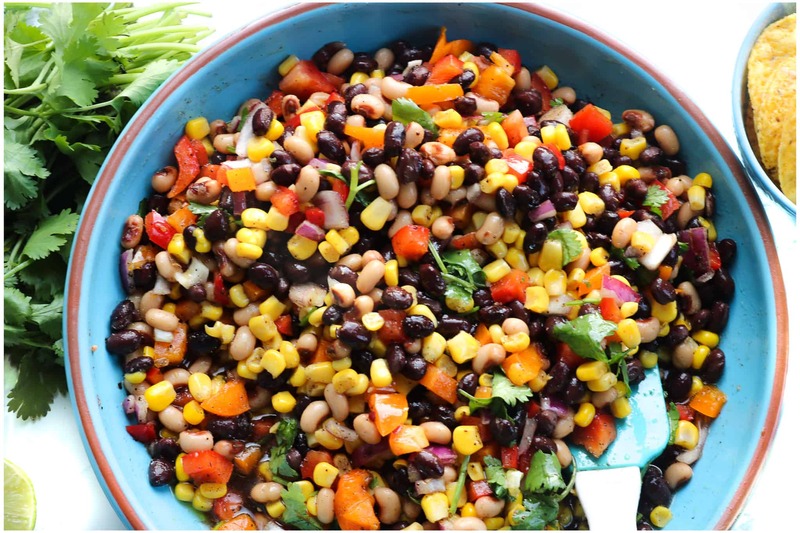 These look so easy and more flavorful – definitely inspired to try them next weekend! Yes, you can definitely add cooked bacon to the mixture. I am always looking for quick breakfast ideas. I love this make-ahead idea! Delicious! These look amazing and would be perfect for on-the-go meals. Egg muffins are perfect for meal prep. 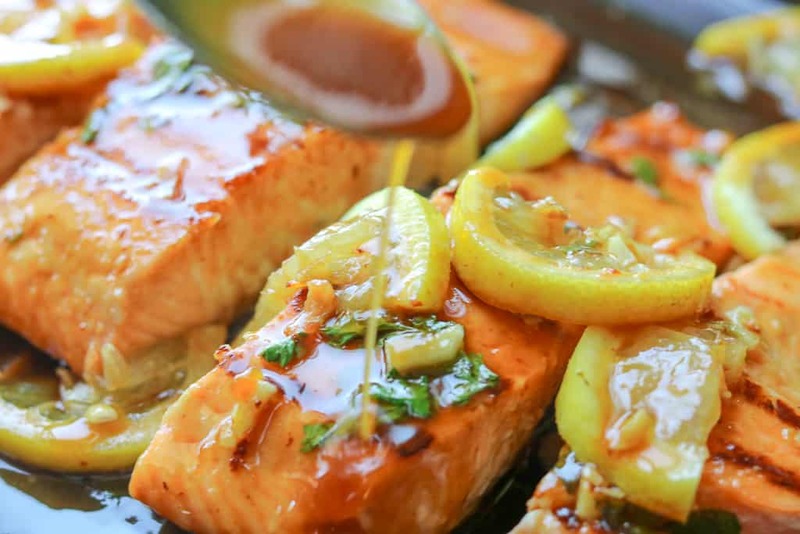 I have to try this recipe, looks delicious! These are so cute and perfect for a breakfast on-the-go for mornings. Love the addition of mozzarella cheese!